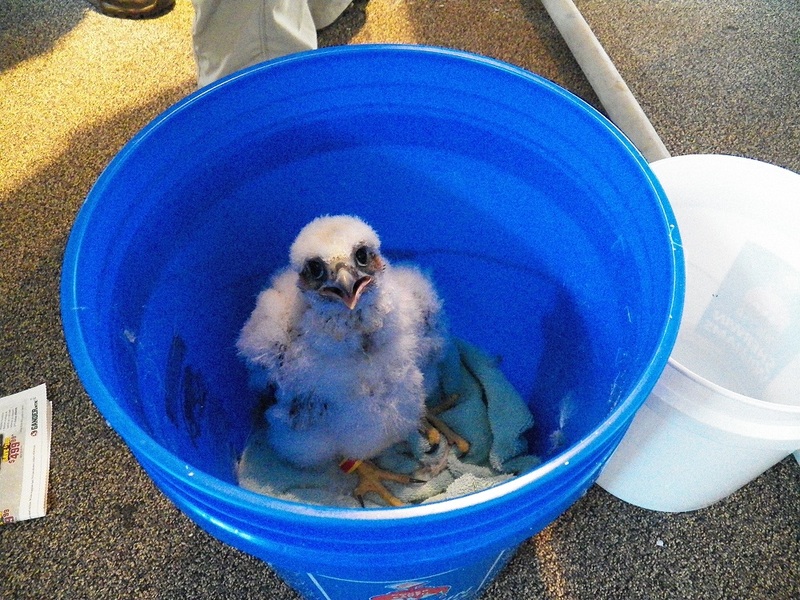 Today was banding day for the three young eyases (young falcons) in the nest box high on top of the Times Square Building located in downtown Rochester, NY. 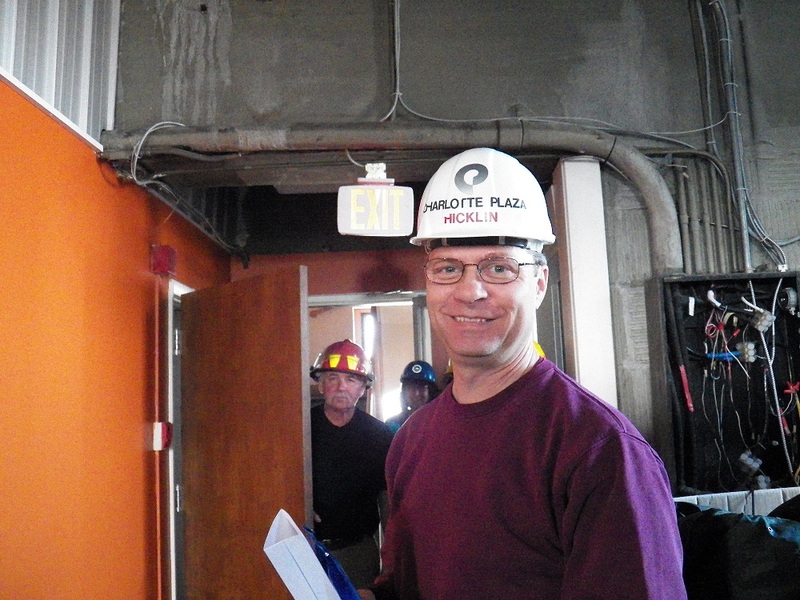 Our friends from the Department of Environmental Conservation were there to band them. 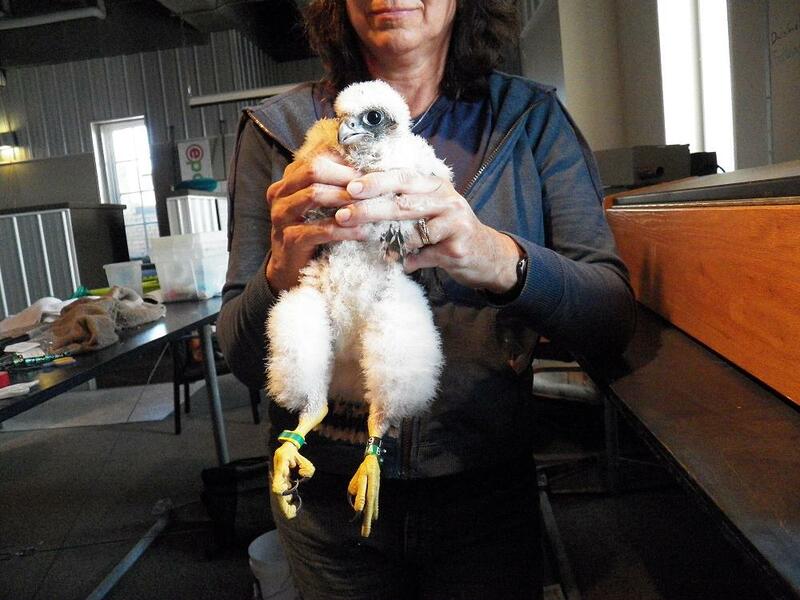 At the same time they are banded, they were given names chosen by Rochester Falcon Fans and Watchers. The extraction of the eyases went very smoothly. Both parents, Beauty and Dot.ca were there and they showed their displeasure when their young were taken. 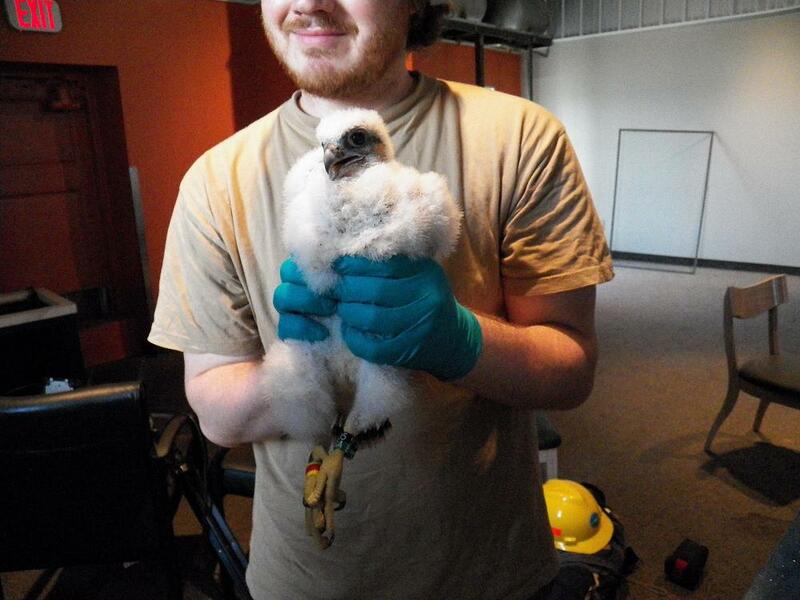 The young Peregrine Falcons were brought into the building where they were banded. 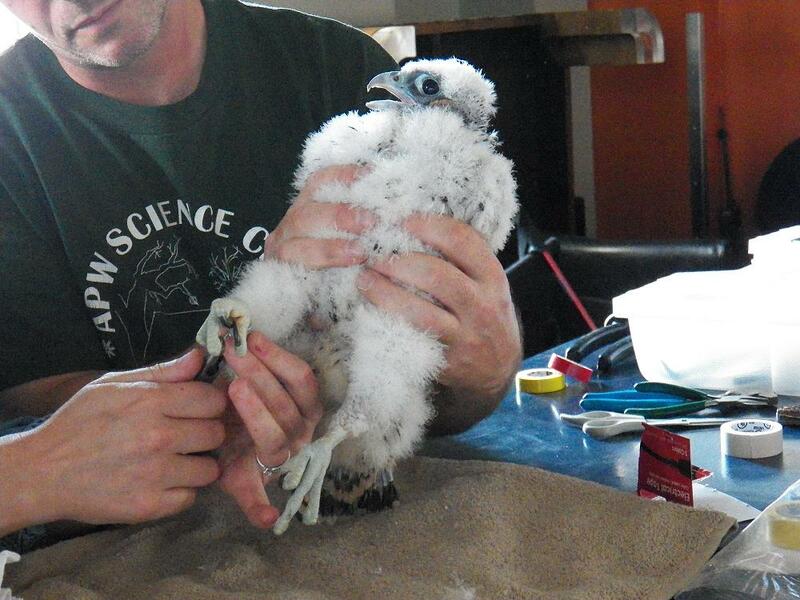 First their gender is determined by measuring the circumference of the leg. Females are larger than the males. The first eyas was a female and she was given the name Rosetta. 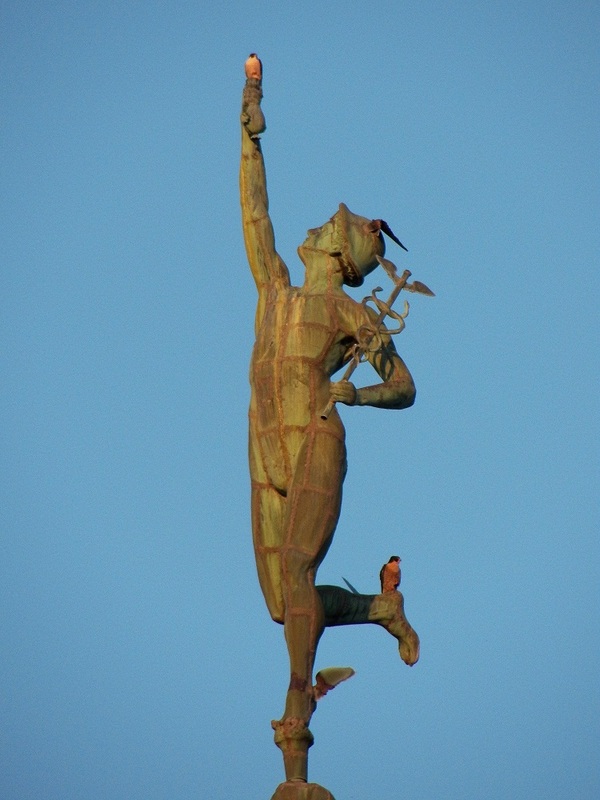 Rochester Falcons Fans were asked to submit names for one of the eyases. Then the names were voted for by the members of the Rfalconcam Forum. The winning submission was sent in by Eileen Karle of Kerhonkson, NY. Rosetta McClain Garden is a park on the Scarborough Bluffs above the shores of Lake Ontario in Toronto, ON. It is the home of a raptor watch founded by Frank Butson. 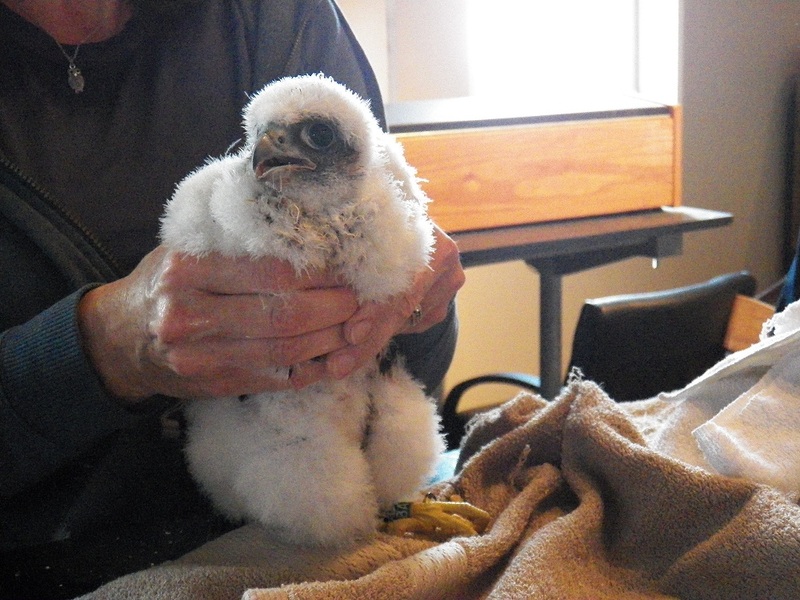 Big Frank is no longer with us, but his legacy of caring for raptors of all kinds lives on in our eyases…he rescued Dot.ca soon after he fledged. 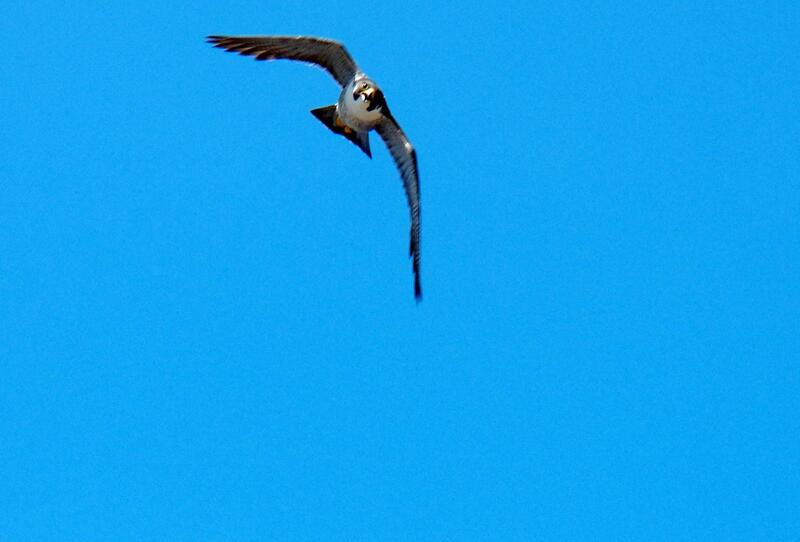 The second eyas is also a female. 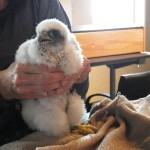 Her name is Voyager, chosen by long time Falcon Watcher Larry O’Heron. The twin Voyager 1 and 2 spacecraft continue exploring where nothing from Earth has flown before. In the 33rd year after their 1977 launches, they each are much farther away from Earth and the Sun than Pluto. Both spacecraft are still sending scientific information about their surroundings through the Deep Space Network (DSN). The primary mission was exploration. After making a string of discoveries, the mission was extended. The adventurers’ current mission, the Voyager Interstellar Mission (VIM), will explore the outermost edge of the Sun’s domain. And beyond. 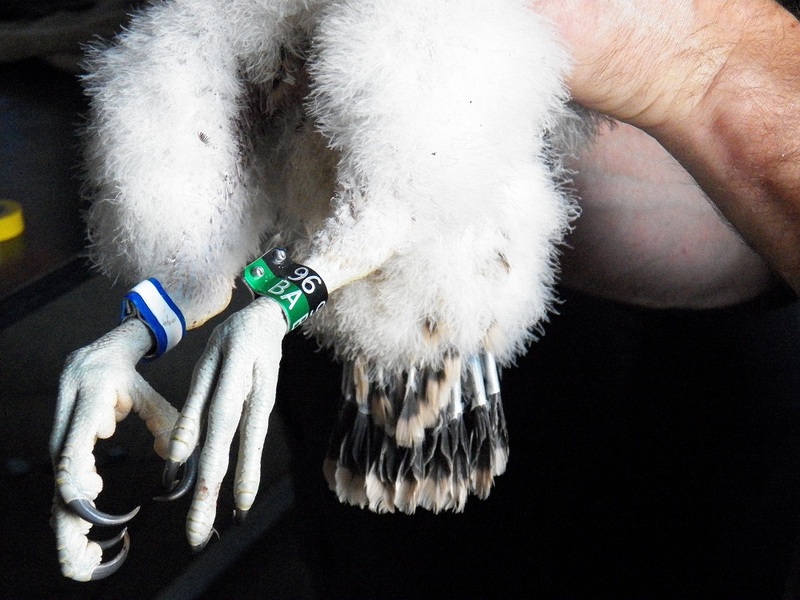 The 3rd eyas banded was smaller. 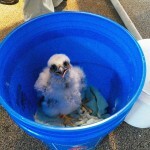 This little male was named Baron, named by another long time Rochester Falcon Watcher, Lou Capuano. The word ‘Baron’ means warrior or nobleman. It’s associated with individuals who possess great power or influence in some field of activity. An example is the ‘Red Baron’, perhaps the most widely known flying ace in history due to his prowess in the air. 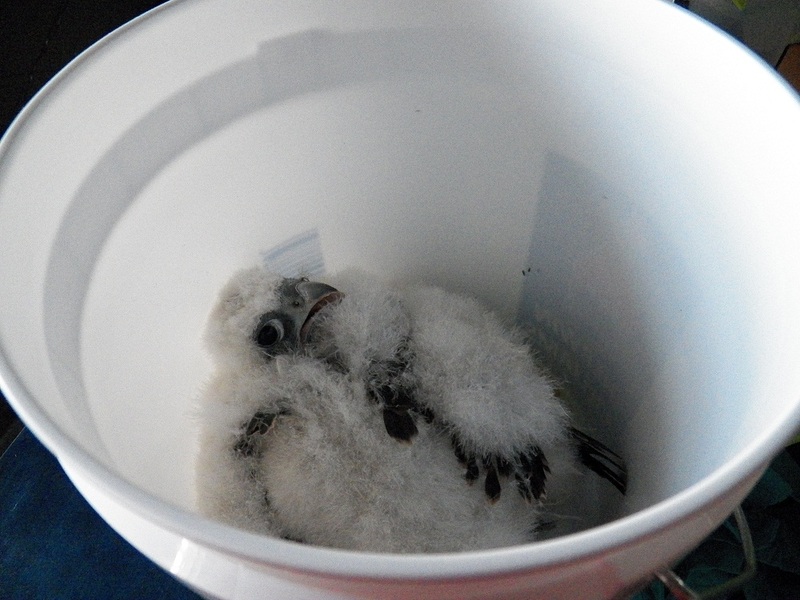 The banding of the eyases was over quickly and they were returned to the nest box where Beauty joined them, sitting on the Rfalconcam main camera. 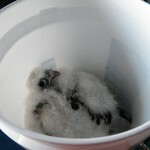 Things are back to normal in the nest box. Be sure to check out our cameras and live streaming video to see what is happening with Beauty, Dot.ca, Rosetta, Voyager and Baron. 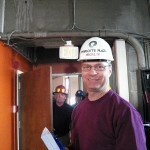 Here are some more pictures from banding day. Banding will take place this afternoon at approximately 2 pm. 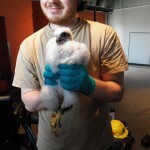 There will not be live camera coverage of the actual banding. However, we plan to keep our nest box cameras running and post updates to our Forum, Facebook, and Twitter throughout the event. It’s Time to Vote for Names! It’s time to vote for your favorite names for one of Beauty and Dot.ca’s Eyases! The polls are open! We received 90 wonderful name suggestions. 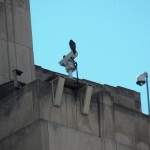 The Rochester Falconcam’s Naming Committee evaluated all submissions and pared them down to 11 names in each of the three categories: male, female, and gender-neutral. (The committee had planned to narrow them down to 5 in each category, but there were just too many great suggestions!) Thank you to everyone who submitted names. The winner of the male name poll receives 30 votes. The winner of the female name poll receives 20 votes. The winner of the gender-neutral name poll receives 25 votes. In this scenario, if the eyas is determined to be a male, it will receive the winning male name because it received more votes (30) than the gender-neutral name (25). However, if it is determined to be a female, it will receive the winning gender-neutral name because it received more votes than the female name (20). A questionnaire will be sent to the email address you supply during registration. You must reply to this email in order to have your membership approved. Even if your answer to every question is “None of your %@#& business,” you must reply, or your membership cannot be approved. The polls close at 10:24 am (EDT) on Thursday, June 13, 2013. The numbers are really close. One or two votes could make a difference. Every vote will count. So to give everyone a chance to vote, the voting period is being extended an extra day. The polls close at 10 am (EDT) on Friday, June 14, 2013. It’s Time to Choose a Name for One of Beauty & Dot.ca’s Eyases! It’s time to choose a name for one of Beauty and Dot.ca’s Eyases! 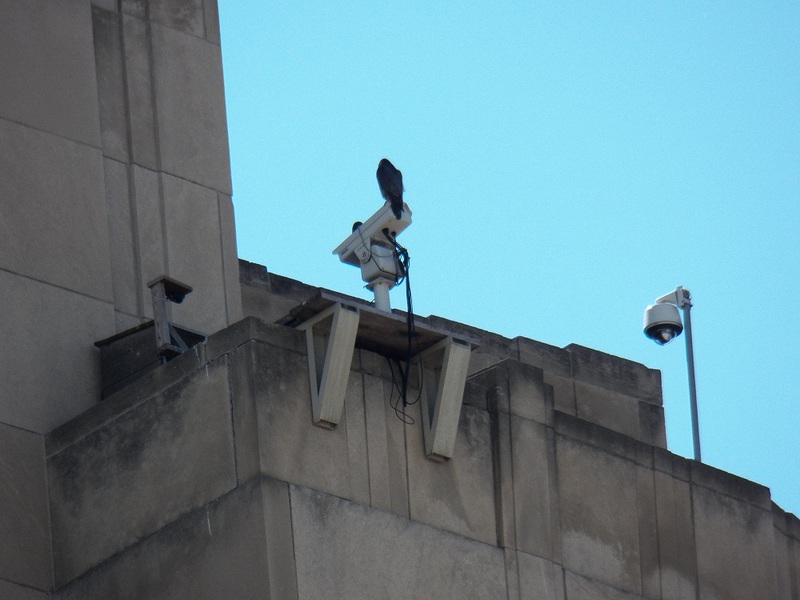 We are very happy to announce that once again falcon fans will have an opportunity to choose a name for an eyas in the nest box on top of the Times Square Building. There will be a naming contest to name one of the eyases. It is open to all our viewers. Much care and thought was used to name past eyases. We’ve included the criteria we’ve always used when choosing a name. Please read the rules very carefully and use the link below to submit either a male and female name or a gender neutral name. Only one submission per person! 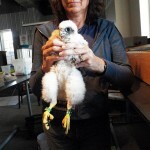 The deadline for name submissions is 11:59 pm (EDT) on Sunday, June 9, 2013.
International appeal (e.g., Galileo, Amelia [Earhart], Magellan), or those who have played a significant role in Peregrine re-population efforts. Names derived from religious, political, or popular culture icons. Names directly related to a human person either living or dead, except as noted in the acceptable criteria above. Names related to a commercial product, or a copyrighted or trademarked name owned by any corporation, individual or organization. Names that reflect negatively on any group, organization, individual or entity. Names should be well researched whenever possible. Supporting rationale for the name is required, so give us a few sentences that explain the name and the reason you chose it. That’s easy! Just click on this link to open the submission form. Only one submission per person please! If multiple submissions are sent in, only the first one will be accepted. 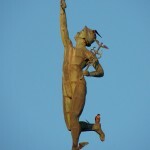 If submitting a name, please do not discuss it here or on the forum. We would like to make this as fair as possible to all participants. 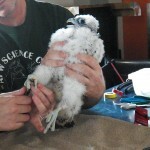 The Rochester Falconcam’s Naming Committee will evaluate all name submissions for appropriateness, including (but not limited to) adherence to the naming criteria, well researched name, uniqueness of the name and how well it follows the “spirit” of past falcon names. The committee will select the top five male, female and gender neutral names from those submitted and create a poll for members of the Rfalconcam forum to vote for their favorite in each category. You must be a member of the forum to be able to vote for a name. Join the forum now if you’d like to participate! NOTE: MEMBERS OF THE NAMING COMMITTEE WILL HAVE FINAL EDITORIAL RIGHT OF REFUSAL FOR ALL SUBMISSIONS, AND THEY MAY REJECT ANY NAME SUBMISSION THAT DOES NOT MEET THE NAMING CRITERIA OR IS JUDGED NOT TO BE APPROPRIATE FOR ANY OTHER REASON. 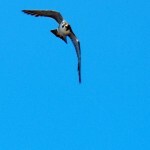 You are currently browsing the Imprints blog archives for June, 2013.